Gumby Fest 2015 is Sure to Make You Smile. 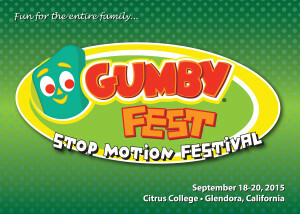 There’s going to be something for everyone, young and old, from Gumby fans to animation aficionados at the Citrus College Gumby Fest Stop Motion Festival, Sept. 18-20, at the college, 1000 W. Foothill Blvd., Glendora, California. Gumby turns 60 this year, so it’s a great time to celebrate the pop culture icon. Not only is Gumby Fest 2015 full of free family activities, it also provides an inside look into the animation industry from leading film and television professionals. Fans, animation hobbyists and the next generation of animators will enjoy the many fascinating presentations and discussion panels. Among the free fun will be the Gumby Museum with original stop-motion puppets, sets, props and amazing photos from the rich 60-year history of Clokey Productions/Premavision which also created Davey and Goliath. This is a unique behind-the-scenes look at how Gumby came to life through stop-motion animation. The museum display will be at the college’s Hayden Memorial Library Art Gallery from Sept. 1 to Oct. 16. Join us at Gumby’s 60th Birthday Bash on Saturday at 4 p.m. and the awards ceremony for the stop-motion animation contest hosted by Gumby Fest 2015. The Grand Prize is The Clokey Award, named after Gumby creator Art Clokey. Come see the creative animated shorts produced by children, college students and stop motion artists. Other activities include screenings of Gumby and Davey and Goliath episodes along with a community fair, Gumby collectibles, food trucks, bounce-houses for kids, live rock bands and children’s art projects. Kids can try their hand at animation, make a clay Gumby, paint a set, create puppets, make a flip book, and more. Check out this ABC special report on Gumby Fest. KTLA broadcast celebrates Gumby’s Birthday and recommends Gumby Fest. Take a sneak peek of what to expect at Gumby Fest. 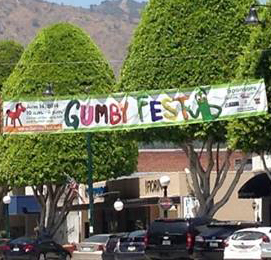 Here’s a great a great article about Gumby Fest in the Pasadena Independent. 3:00 p.m. – Maleficent Director Robert Stromberg. He won Art Direction Academy Awards for Avatar and Alice in Wonderland. 1:00 p.m. Film Focus: “The Nightmare Before Christmas” (And The Gumby Connection) with animators Tim Hittle, Anthony Scott and Harry Walton. Scott, Hittle and Walton worked in the Gumby studios in the ’80s, and on Nightmare. They will share clips and behind-the-scenes moments and important scenes from the film. See details about Main Stage presentations here. “Stop Motion University: Colleges Offering Stop-Motion Animation” and more. See the free presentations schedule here. The fun begins at 8 p.m. Friday, Sept. 18 in the Haugh Perfor ming Arts Center with Cinema Vivant, presented by The Hot Club of San Francisco who plays gypsy jazz swing against a backdrop of three early stop-motion animated films. Tickets are available at www.haughpac.com. Tickets for all Haugh presentations are $10 per adult and $5 per child. Limited Edition All-Access Passes are available for $25 (one day) and $40 (two day). Tickets and All-Access Passes are available by calling the Haugh Box Office, (626) 963-9411, Tuesday-Saturday, 11 a.m to 4 p.m. Drawing Workshop: “Flippin’ Out” – create a simple animation flip book. Ceramics Workshop: “Clayin’ Around With Gumby & Pokey” – hand paint and glaze a bisque ware Gumby or Pokey. Painting Workshop: “Set the Scene” – paint your own stop-motion animation background. Screen Printing Workshop: “Screen Printing A Character” – Create a multi-colored screen print and learn about limited editions. Photography Workshop: “Photograph Your Character” – Learn about lighting, backdrops, selfie techniques to create amazing photos. Sculpture Workshop: “Creating a Bendable Armature” – Use wire to create an armature for a stop-motion clay figure. Stop-Motion Workshop: “Make Your Own Stop-Motion Animation” – stop-motion workshop using DragonFrame and iPad stop-motion apps ($10 fee includes flash drive with your animation). Tickets for the art studio workshops are also available at www.haughpac.com. The Festival will be staged at the college’s Performing Arts complex that includes the 1,400-seat Haugh Performing Arts Center, the Little Theater, rehearsal halls, computer labs, classrooms, a large technical theater sound stage, dance studio, and a state-of-the-art audio recording complex, as well as other campus locations. 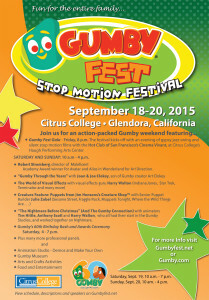 Proceeds from Gumby Fest 2015 will benefit the Citrus College Foundation to benefit Visual Arts Department students. Visit the Gumby Fest website. See the Gumby Fest Flyer PDF.